Home > Resources > Recover Samsung > How to Recover Deleted Music from Samsung Galaxy? Samsung Galaxy is a series of mobile phone that runs the Android operating system. People love it due to its exquisite design as well as multiple functions. You can use it to make interesting recording and save precious music and songs, so that you can share them with your friends and families. What if you deleted your valuable music and audio files from Samsung Galaxy by mistake? 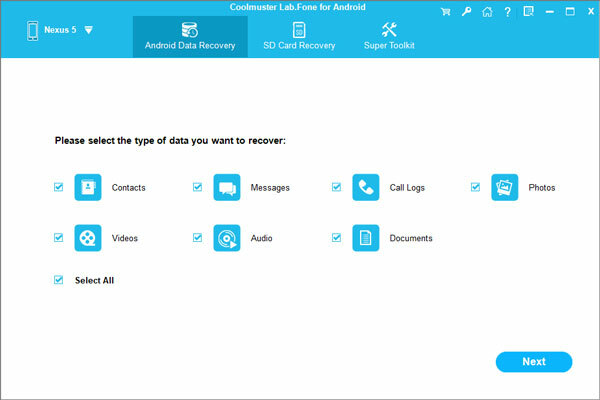 Next, we will tell what you need to know about Samsung music recovery by using the professional Android data recovery software - Coolmuster Lab.Fone for Android. It provides the fastest way to recover data, including music, videos, photos, contacts and text messages from Samsung Galaxy S9+/S9/S8+/S8/S7/S6/S5/S4/Note 8/Note 7/Note 5. It can recognize and recover music files in various formats and also support other Android phones like HTC, Sony, Motorola, LG, etc. Free download and install this Coolmuster Lab.Fone for Android on your computer. Below is the guide to show you how to recover deleted audio and music files from Samsung Galaxy with the software. After you download and install the Samsung Galaxy music recovery tool on your computer, connect your Samsung Galaxy to the computer and the program will ask you to open the USB debugging on your Samsung phone if you haven't opened it. 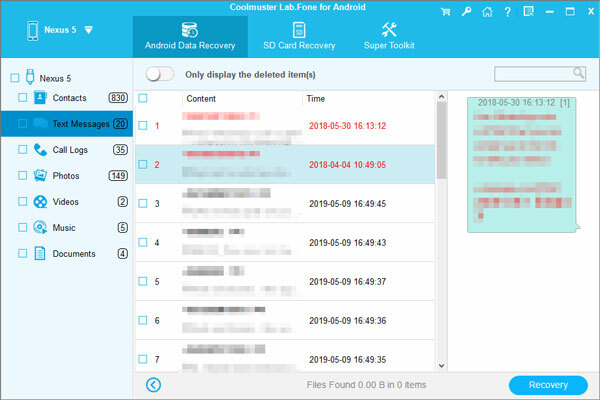 Once the USB debugging is enabled, Lab.Fone for Android will scan your Samsung Galaxy and display all types of files you can recover. You can choose the folder named "Android UMS..." to find the music files you have deleted. You are at the last step now. Preview and mark what you want and recover them with one click on the "Recover" button from the top line. Now, you are allowed to choose a location on your computer to save the recovered Samsung music. Everything becomes easy, isn't it? Just download the Android Data Recovery to begin your recovery now!